In Period Living we showcase some of the most beautiful rural period properties in the UK and Ireland to help you capture country style, whether your home is in a bucolic setting or not. At its heart, country home style is simple and unpretentious. This makes it such an enduring look that translates from the grandest of manor houses to the humblest of cottages. To recreate the look, the secret is eclecticism – so mix antiques, vintage and salvaged treasures with well–crafted new pieces to give the look of a home that has evolved through time. With nature on your doorstep there’s a wealth of inspiration to draw from. Complement period features with natural materials, muted tones and flora and fauna motifs to bring your home closer to its stunning surroundings. This 17th-century cottage had almost fallen into disrepair when Neil Mckay and Helen Davison rescued and sensitively restored it using sympathetic materials and traditional processes. Originally a row of farmworkers’ dwellings, it has been transformed into a humble, rustic home with contemporary touches. The couple made it their duty to preserve all the charming country cottage features where possible, such as original beams, stable doors and stone flagstones. When it came to restoring interior walls the couple used breathable lime plaster, limewash and handmade their own linseed paint, this helps protect the building from damp but helps capture that authentic, rustic aesthetic. Although this Grade II*-listed home dates back to the 14th century its interiors have been updated to create a pleasing balance of old and new without compromising the wealth of characterful features. What’s more it comes with 1,200 acres of farmland. 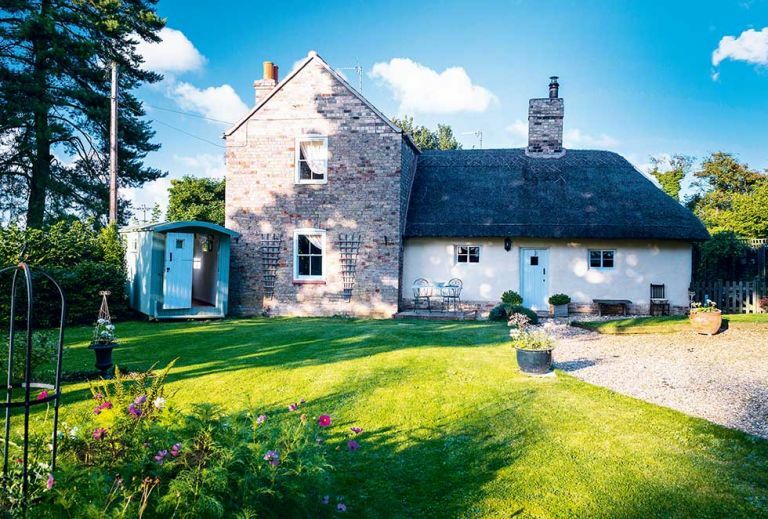 Former winner of Period Living‘s Readers’ Home Awards, this 18th-century thatch was lovingly restored by Alison Lewis, after being bought as a 50th birthday present. In true period cottage-style there are no right angles or straight lines to be seen in this home, instead waning beams and crooked brickwork add quirk and character. Home to Cabbages & Roses founder Christina Strutt, this rural gem is brimming with quintessential English charm. Behind its aged facade weathered furniture sits alongside faded floral fabrics and French antiques for a beautiful country haven. Take a tour around Chris and Alison Young’s slice of rural England, originally built as a squatter’s cottage in the 18th century. Behind the chocolate box exterior the thatched cottage has all the character you’d expect from a property that’s evolved over 300 years. Pretty floral prints, flea market finds, rustic timber furniture and traditional must haves – such as stick back chairs, a country dresser and a sheila maid – combine to give this relaxed kitchen classic English charm. Combining sought after features such as a deep Inglenook fireplace and exposed stonework with vintage and classic furniture, the interiors of this Cotswold cottage certainly do justice to its charming exterior. Wendy and Peter Blakeman employed a wealth of DIY to turn a dilapidated farmhouse into a welcoming and elegant country home. Wooden beams, a cream range cooker and shaker cabinetry: the kitchen has all the ingredients of classic country style. A keen cook, Wendy wanted it to be a bright room with plenty of work space. With low beamed ceilings, whitewashed, uneven stone walls and open fires, this sensitively repaired cottage nestled in the depths of the Irish countryside is a humble yet characterful hideaway. The owners opted for simple decor and furnishings to let the unique architectural features really sing. In the kitchen, freestanding wooden furniture such as classic pine dressers are teamed with purpose built plaster work units for an informal country feel.